The California State Senate today voted in favor of a stricter version of the federal net neutrality regulations that are being repealed by order of the FCC on June 11th. Net neutrality forces ISPs and wireless carriers to treat all content the same. Without it, companies like Comcast and AT&T could, in theory, sell "faster lanes" to content streaming companies (think Netflix) in exchange for sacks of cash. Eventually, some of those extra payments could result in higher monthly subscription rates for consumers. Net neutrality also prevents providers from blocking certain content from reaching consumers. In theory, when the regulation is lifted next month, a cable firm could block CNN if the company's CEO doesn't like the news network's politics. Besides replacing the original net neutrality rules that the Obama-era FCC voted in favor of in February 2015 by a 3-2 vote, the California bill would ban paid data-cap exemptions; this would prevent content providers from paying carriers to offer their streaming services to wireless users without it counting against their data caps. All 35 votes were along party lines, with 23 Democrats voting for the bill. Net neutrality has a rather easy path to becoming law in California since it just needs to get past the California State Assembly, which has a majority made of Democrats, and get the signature of Governor Jerry Brown. Brown (who once dated Linda Ronstadt, not that it matters) is also a Democrat. A bill similar to California's SB822 is being considered in New York. As for the federal net neutrality regulations, a Congressional Review Act (CRA) vote to overturn the FCC's order to repeal made it past the Senate by a 52-47 count (49 Democrats and 3 Republicans voted "Aye, ailing Sen. John McCain was absent). The next stop is the House, where passing the CRA will be a longshot. And even if it should get through the House, it would no doubt be vetoed by President Trump. Overturning a presidential veto would require two-thirds of both chambers to vote in favor of the CRA. It would seem the best way to save net neutrality would be for each state to follow the examples set by California and New York. 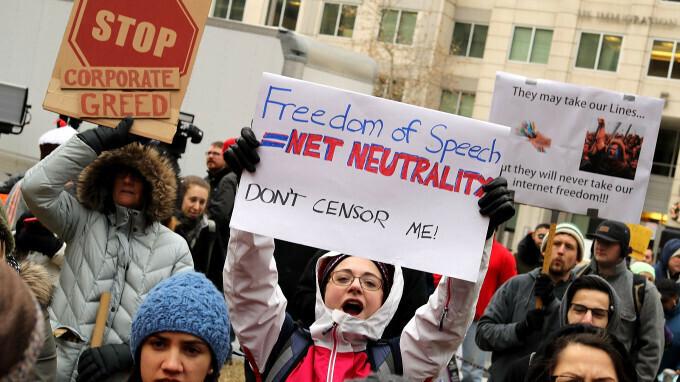 Polls show that a majority of Americans want net neutrality to remain in place. Alan, stop posting your stupid politics. Nobody wants to hear it. I'm not even a republican and I didn't vote, I'm just sick of the whining. Stop before this becomes another in a long list of sites that have made it on my block list from incessant whining and off topic posts. This site is about phones, not politics. phoneArena publishes articles pertaining to: "editorial content about cell phones and the surrounding ecosystem." -PA With mobile data and the internet being highly prevalent in the use of a cell phone, news articles about net neutrality are definitely relevant to what this site is about. It's not. It's strictly about politics. Just like the 800 trump articles that have been posted on the site. They should stick to what people actually come here for.... Politics aren't it. I'm not "sensitive", unlike the people like you who can't stop talking about politics. Did I say anything about trump in the first comment, no. It helps to actually read what is written. I'm sick of the constant blabbering about politics. I don't even vote, and I don't like trump, as I stated before. But clearly reading isn't on the list of the commentors things to do. Next, the Cali law, as you even pointed out, is a detriment to the consumer because it doesn't allow for companies to pay for your usage on their site. Which they should be allowed to do, if they so chose. But hey, as the idiots below pointed out, I'm just a "trump bot" that doesn't even like the guy. I swear this place is about to get put in my blocklist just like Engadget. As a CA resident I'm glad they posted this article. If you don't like it then why did you come to this page? Was it just to whine? This is highly important to our smartphone and technology future. The Trump bots above can power down now. No matter who(Republicans or Democrats) is doing what and is on which side, Net Neutrality needs to be protected. Scrapping Net Neutrality and giving preferential treatment to some will be disastrous for Internet age. It will also give access to certain powers to control the internet, decide what we watch and what we don't. And that would be a dark world.